The market managed to add a few more points to the bullish wave from 1485 and the DOW came within a few points of its all time closing high but then all gains were reversed as expected. So tomorrow we should see the bears answer to the 40 point rally and I think it is now a monumental task to reverse all the bullishness in the markets but who knows? I am still watching the same level as yesterday so again, if 1498 holds and we get a quick bullish bounce, then the market will be headed towards 1550+. And btw I made a mistake yesterday (thanks TDD), the all time high is at 1576 not 1555. But I think a challenge to the all time high is highly likely on this coming wave or after the correction (if we still see more selling). 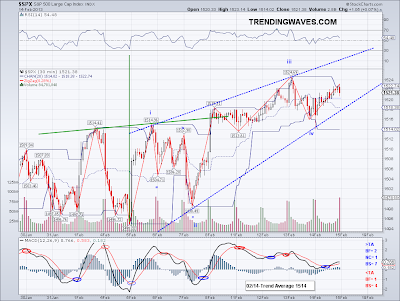 Once there, it will be interesting to see if the market can break out of this range and go way higher. And yes, I know there are many bad news that the market seems to have completely ignored and as much as we rationalize it, it's just better to trade with the price trends.. again, the opinion vs fact battle. The short term trend average is now officially in neutral as we got 2 closings above the TA but the number is not trending up. So we should get an answer tomorrow or Monday. I will be closing my hedge depending on how the correction evolves, the same can be said about some of the additional HSI longs added. For now, it seems like we will continue to rally. 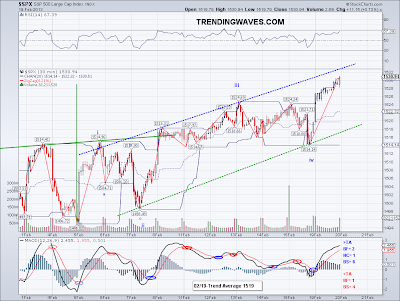 The wave today added looked very impulsive and the new high on the DOW makes this new wave likely bullish W1 of a W5. I had been hoping the market would at least test the 50 DMA but if the market indicates its done correcting, then we just need to follow the trend. I am looking again at the 1498 level which has now turned support. If this holds on the next bearish wave then we will have a nice Inverted Head and Shoulders targeting the all time high at 1555. 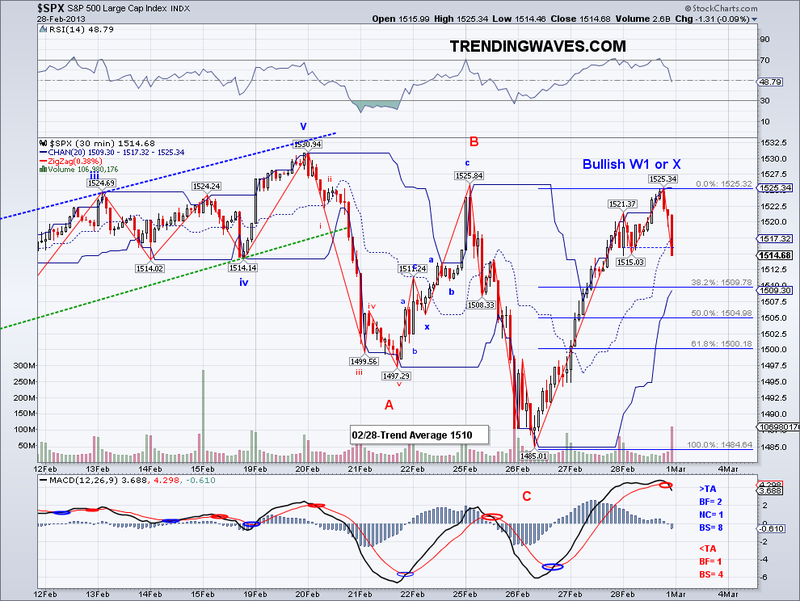 Technically W2s are free to retrace 99% but that level holding would be a clear marker. 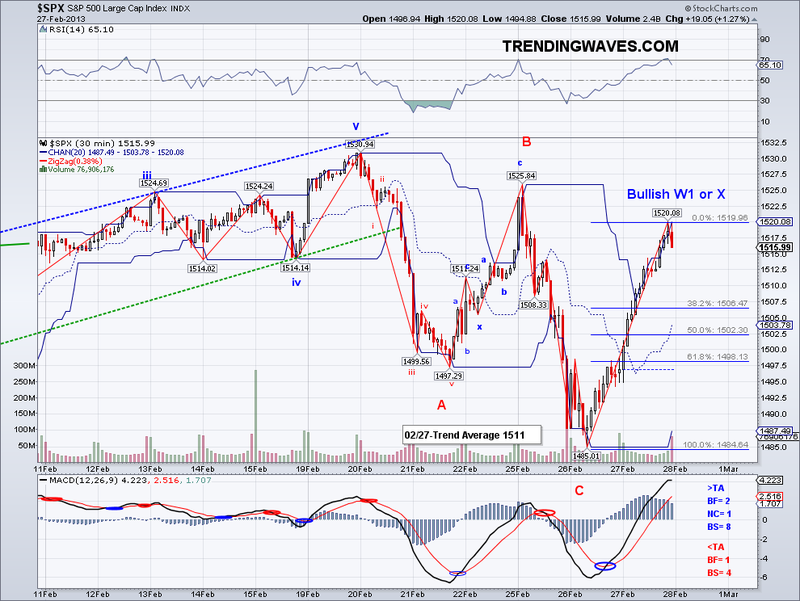 The only way this bullishness could be reversed if bringing down the index to a lower low (below 1485), which still could be a possibility. But given the fact the market is expecting a failure for a budget sequester deal and already aware of the potential euro problem, any good news could be used as an excuse to mount a big rally.. specially if there is some sort of compromise on the budget. I bought back some hedge at 1512 through SPXU (not that crazy VXX which now trades $3 less than couple of days ago) and bought back 5% of my long term portfolio through FXI at $38.55. So now I am 85% long and will add the rest when 1485 is confirmed as the low as we will probably see a worldwide market rally. 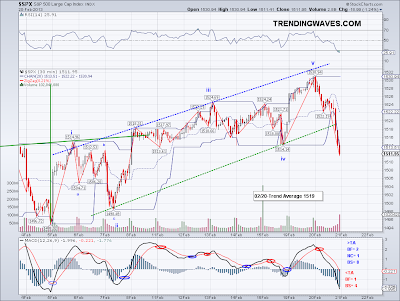 The market bounced as expected today but the wave went into the wave I have labeled "A or 1", so this makes it less likely that we are seeing a 5 wave count. 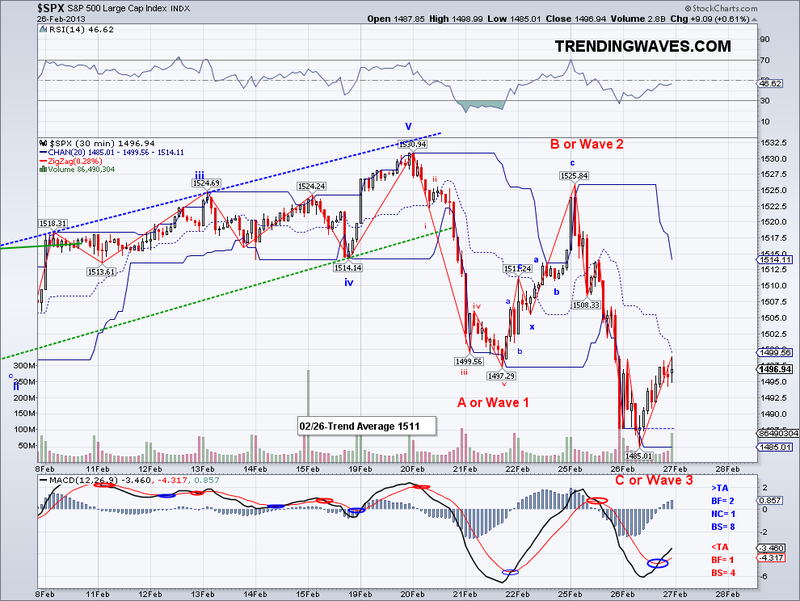 So for now the main options are this is either a X wave with another ABC to come or Wave 1 of a 5th Wave. If this is indeed a bullish W1, the bottom should have been today as it would align well with the second chart I posted where the market bounces off the lower channel from months ago. 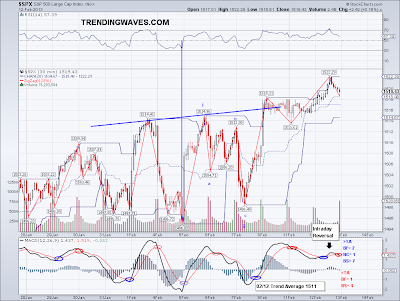 Also, it could put in a nice inverse head and shoulders with the current pattern. But with the sequestration coming and Europe, I would assume odds favor further selling at least to test the 50 day ma or gap support at 1450. I am completely out of the US market and waiting for a good risk/reward scenario, which should come at support or at resistance around the Trend Average. For now the market could go either way but first it needs to overcome that 1498 level I first mentioned last week as support, which has now turned into resistance. 50 Day Moving Average test next week? Last week I posted that there was a good chance there would be a top this week and we got that top on Tuesday. How this correction evolves will probably give us a good idea of how the market will behave in the next couple of months. As of now we have one good bearish impulse and a double zig zag correction to test the Trend Average which should be finished or about to be finished early next week. And I am assuming the next bearish wave will be similar in length to the first bearish leg, so if Trend Average holds then we will see a wave to the low 1480's and more likely the 50 day moving average which rises about 1-2 points per day (currently at 1475). At that point the market will have corrected enough to launch another intermediate bullish leg but this is only if the 50 day moving average holds. If for some reason the market loses the 50 DMA, then I will be looking for gap support at 1450. 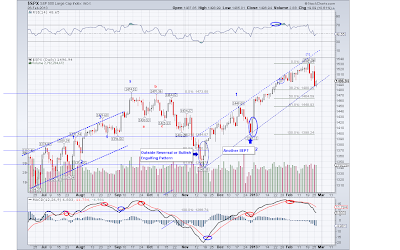 Alternatively, should the market gap up strongly on Monday then the 1531 level will be challenged and the short term trend will have a good chance of changing back to the bullish side and confirm the wave from 1531 to 1497 as a Wave 4, which is unusual for a Wave 4 but I've seen sharp one impulse wave corrections before for W4 and I will be ready to cover the hedge of that is the case. However, taking into consideration that the budget sequestration will take place on March 1st and there are only 5 days left to get a deal done, the environment favors further selling and not a rally. Today's market action confirms the bearish short term trend change and now we will be looking at the Trend Average as the level to watch on counter rallies. 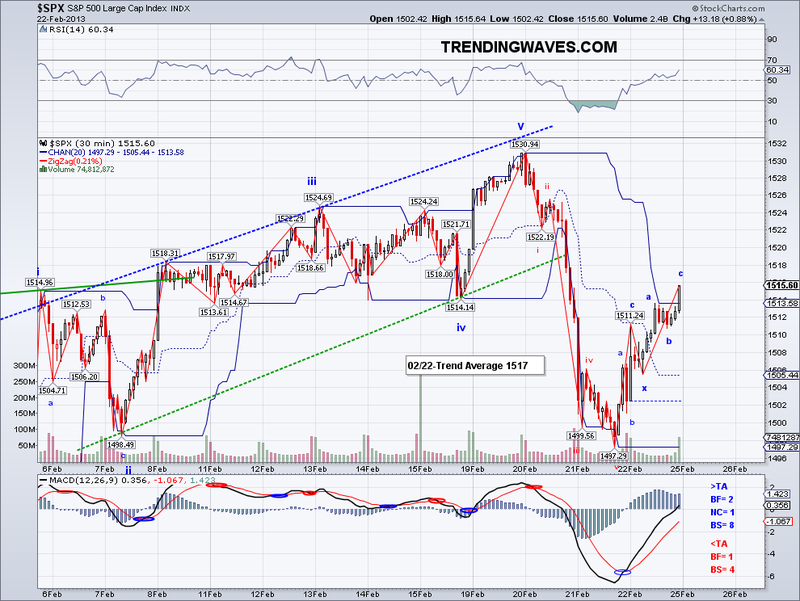 There are 5 waves down on a very steep wave and the bounce could be either a Wave 2 or a B. However, there is also the chance this wave is not done yet due to how steep it is, so the bounce might just be a Wave 4 with another bearish leg to come. Either way, we should see some sort of bounce before seeing more selling. The 1498 level I mentioned yesterday has held well but it looks to me like it will break eventually, so I am now looking at the 50 day moving average as the primary target on the downside. 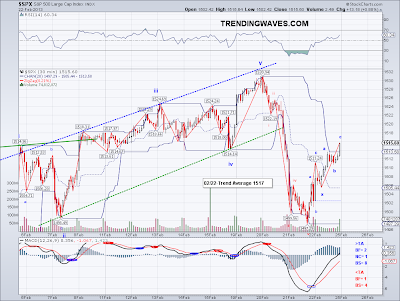 I mentioned there was a potential top on yesterday's post and today's sell off seems to confirm this. 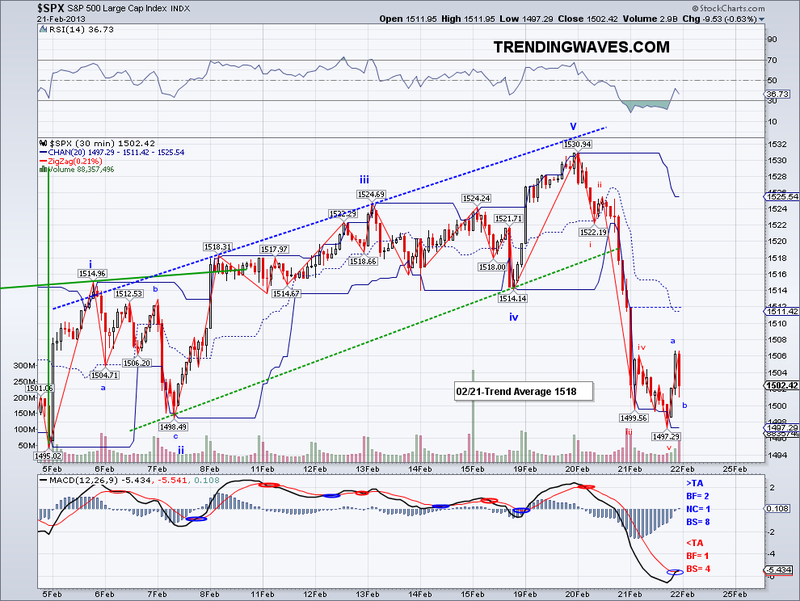 The market came close to 1534 target but there just weren't enough buyers. We have a Bearish Engulfing Pattern or an Outside Reversal Pattern in addition to the 1514 level getting breached, so probabilities are very high that we will see 1498 tested before we see 1530 again. But just like the last time we had an BEP, if the market can reverse the losses on an equally strong bullish day then the bullish trend will continue. But for now, I think it's safe to start projecting downside. We just need Trend Average confirmation which is at 1519 at this point, I am assuming there will be a bounce that will test it in the next session or two but I am betting the downtrend will continue. For now I am watching the obvious support levels which are 1498 and the 50 day moving average at 1471 and going up a few points a day. I don't know if the correction will be a W4 or a W2 so it will all depend on how the correction ends up looking and what levels get tested. 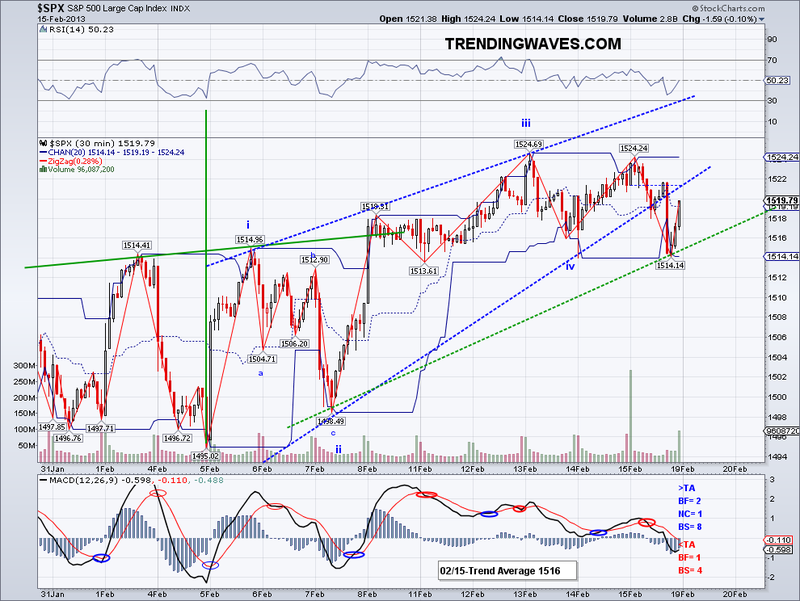 But the bottom line is this is a correction and the market should continue rally to higher highs. VIX shot up 20% today and VXX went up almost $2, so that position is looking better now. 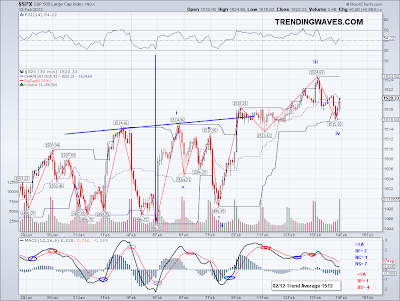 FXI breached $39 momentarily and I will be more than happy to get it in the low 38's. Finally Gold is really selling off, I thought it had reached a bottom but key levels broke. So I will be looking to get out of that position on the rebound. It's not a big position but nonetheless money is simply moving from safe haven type of assets to equity so I rather use that money on stocks. 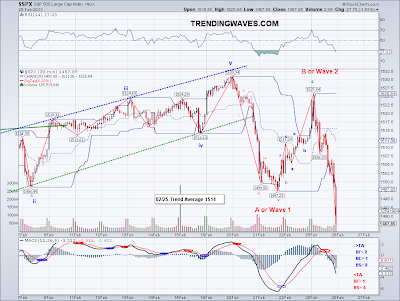 The 5th wave appeared today and it confirms the low on Friday was the 4th wave. So now I am expecting the 5th wave to complete at 1534 (assuming W5=W1) and in turn meeting the Inverse Head and Shoulders target I pointed out on February 7th. 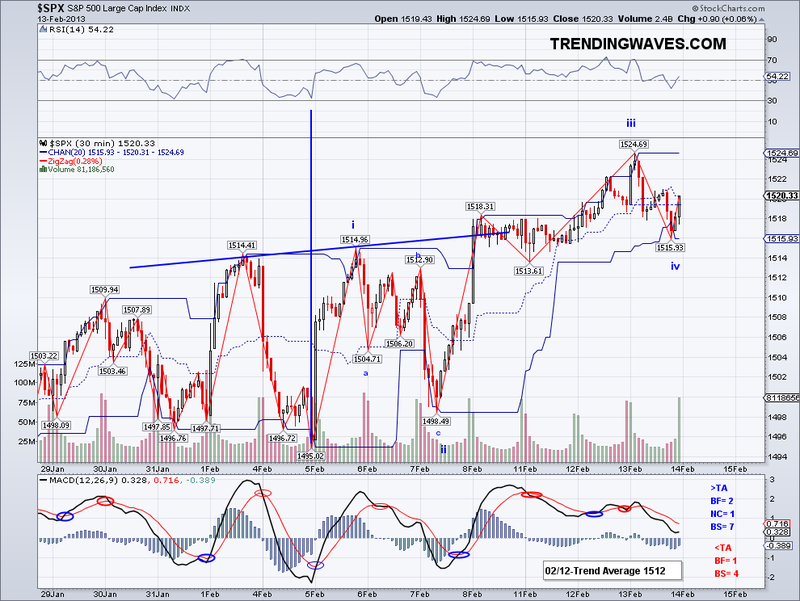 So there is a good chance for gap up or a rally to the 1534 area and then reversing in pre-market or the cash market. 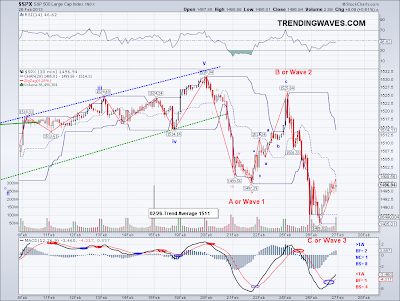 However, there is also the possibility the 5th wave will extend since the 3rd wave was not all that long. 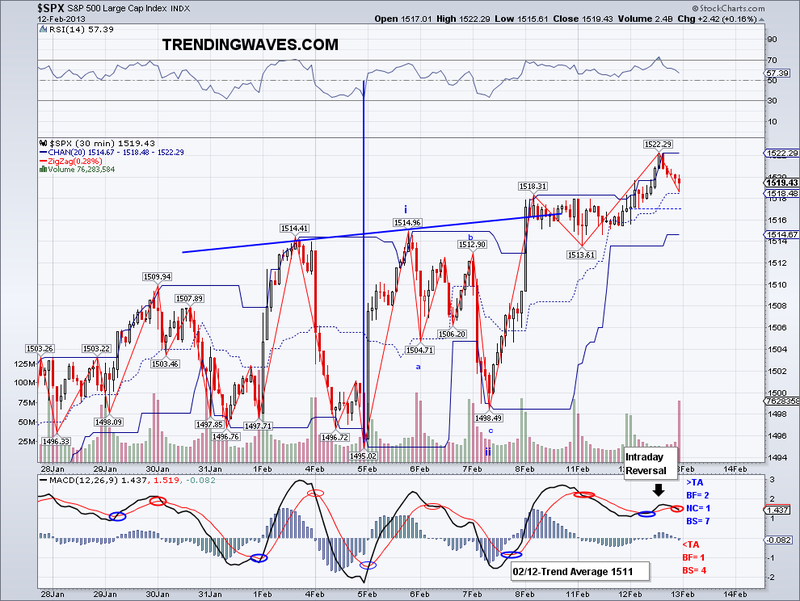 But whatever the scenario turns out to be, there should be some sort of top in the next few sessions. The VIX made a 5 year low today (just as the market had a 5 year high) and the market seems to be oblivious to the March 1st sequestration deadline so it's hard to tell just what the market will do if we don't get a deal (which is already unlikely). One thing for sure is the US has been playing catch up with the rest of the world and that 1600 target for 2013 seems very likely at this point given the fact that money has been moving into equities. I will hopefully sell my hedge for a profit soon and go back to 100% long (if not leveraged long) on the pullback. This is not a market you want to be shorting when the trends are all bullish..
FXI should be in the 38s soon and I hope VXX won`t slide much further. I bought at 22.05 thinking it was cheap, it closed at 21.02.. crazy dangerous ETF. 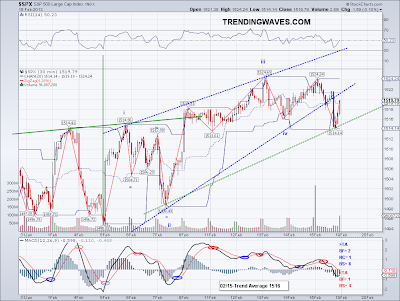 The 5th wave I had been expecting did not materialize today (unless this wave truncated). 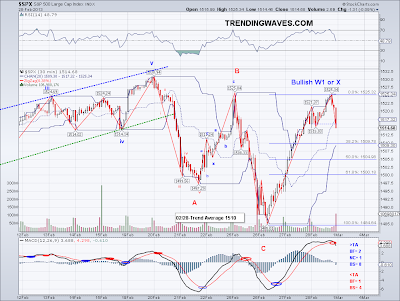 Instead we got a bearish wave that tested yesterday's low but did not breach it. 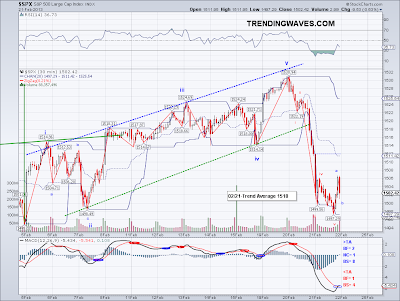 So one could argue that Wave 4 completed today or that the market is done at this point and it is just testing the lower trendline of the rising wedge. 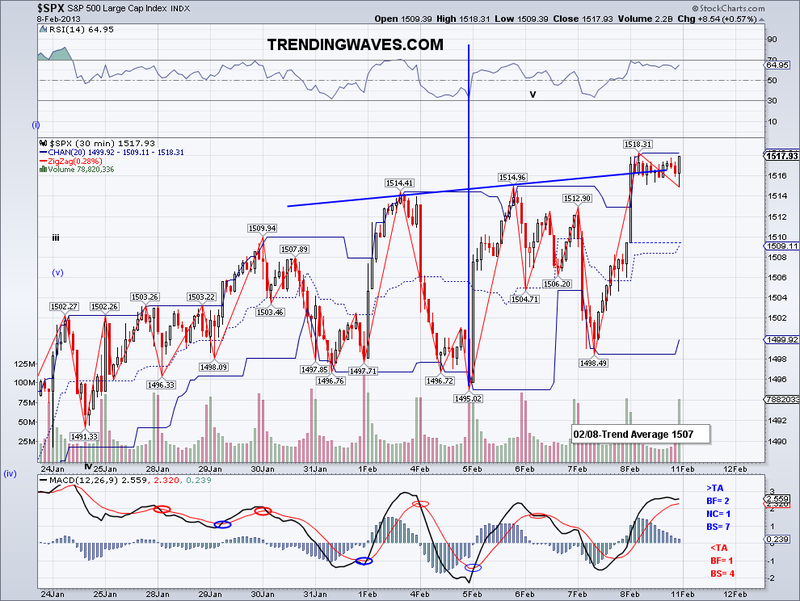 I mentioned 1523 as an important level to watch and so far the market has had problem overcoming resistance at 1524. At the same time, 1514 has held so we'll see if we get an answer on Monday. The structure would look "nicer" if the 5th wave appeared next week but at this point anything can happen, specially since there is the Budget Sequestration on March 1st. 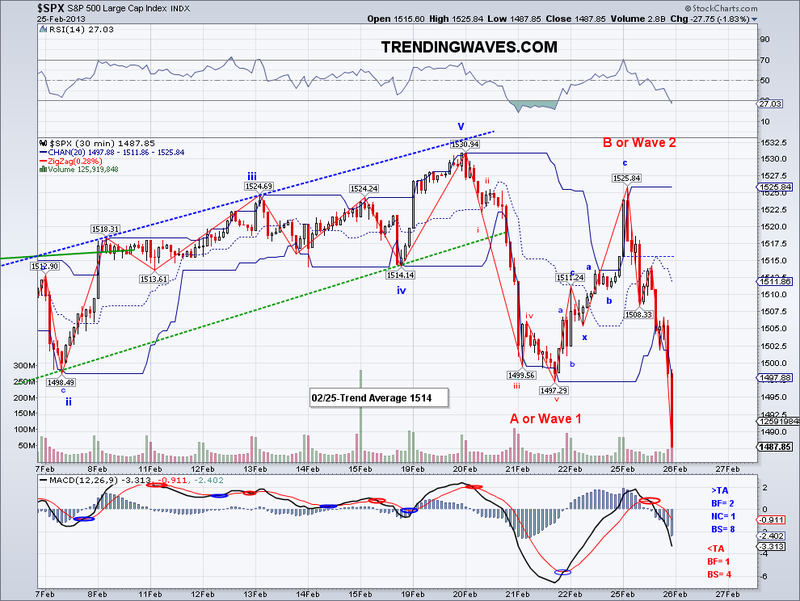 The failure to reach an agreement (which is likely at this point) would be a good excuse for a top of the wave. So let's see if the market tops FINALLY next week. I think people started picking tops on January 1st (Doug Kass was the first one I saw calling for a top then) and no one has been able to pin point it, so for now this is a guessing game. I bought back my VXX hedge at $22.05, so an improvement over my stopped out position yesterday. I almost got it in the $21s but I figure I rather withstand a 5th wave than miss out on a sudden market turn now that we don't even know if the presumably last 5th wave is coming or not.. The slow bullish grind continues but now it looks like it is finally getting close to completion (really). There is an Ending Diagonal (Rising Wedge) pattern in place which are usually found at rally tops so perhaps there will be no more sideways corrections after the trendlines are broken. It is now 6 weeks since the market started its current rally so perhaps the 7th week will do the trick. So far there was been only 1 close under the Trend Average during this entire period and there hasn't been a proper Fib retracement for this wave. So the coming correction is going to be a Wave 4 like correction or a Wave that will bring the market down to the 50 Day Moving Average. 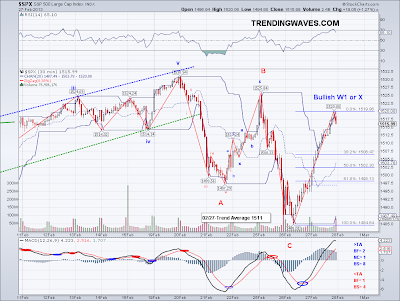 I favor a deeper retracement but a Wave 4 like correction has similar odds. There is also the more orthodox Elliott Wave camp that calls for an end of the entire rally from 666 and they might well be right but the current long term trends and environment don't support that case in my opinion. I just read Warren Buffet was buying Heinz and if he is buying at this time, it is usually a good sign for the overall market. Buffet is the second (or is it third?) richest man in the world because of he has been able to pick the right companies at the right time. So anything he does, I pay attention to.. as a matter of fact, had I paid more attention to what Warren was doing in 2009 instead of the loony Elliott Wave Intl camp. I would be much closer to my retirement goal than I am today as I ended up paying a hefty price during the 2009-2010 period shorting the trend. The fact that one was selling $59 newsletters and the other was one of the richest men in the world through investing should have been clear. But I guess one has to live and learn.. I ended up being stopped out at break even on the 2/3 VXX position I had bought couple of days ago and by the end of the days was about to go in the $21 territory, so maybe by the end of the wave it will be at $20-21. Then I'll go back to fully hedged again and hope it goes up $10! 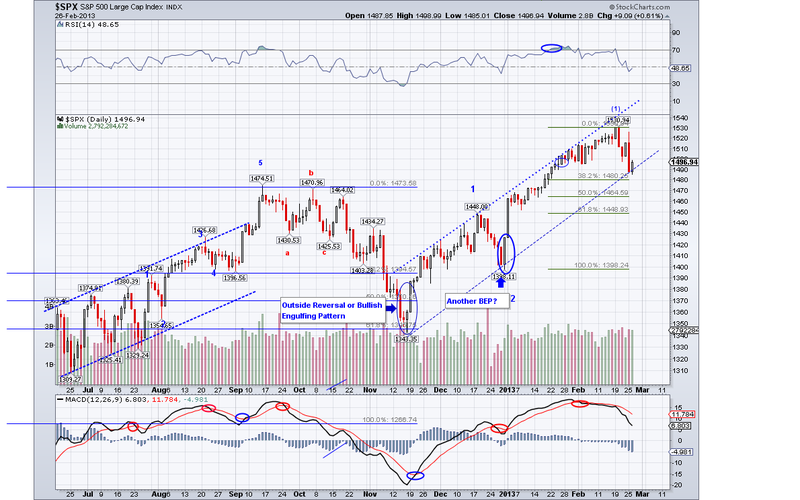 The market continued its slow sideways rise today by making another high. Now that the market is 3% away from the all time high, I have very little doubt a new high will be put in sooner or later this year. 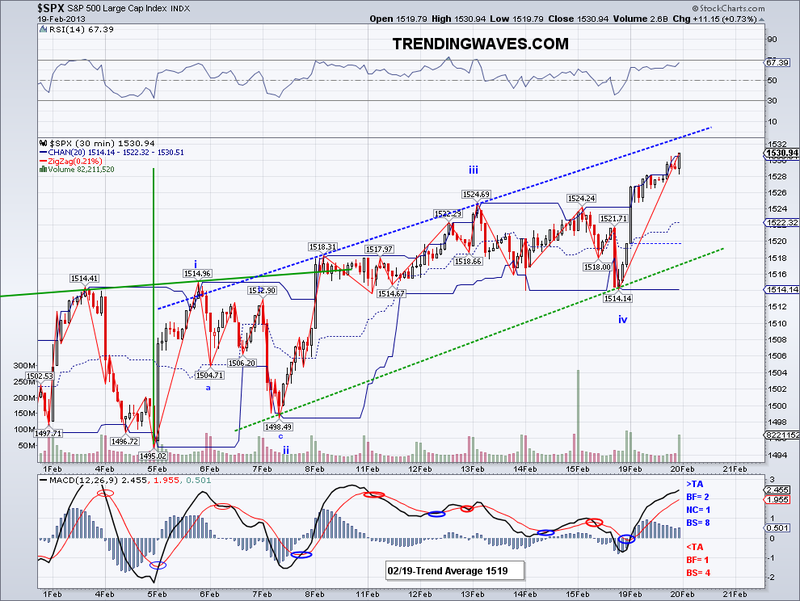 But for now, this very persistent bullish wave just refuses to correct. The best chances for a correction came in last week where there was a potential Bearish Engulfing pattern but that was reversed the next day. 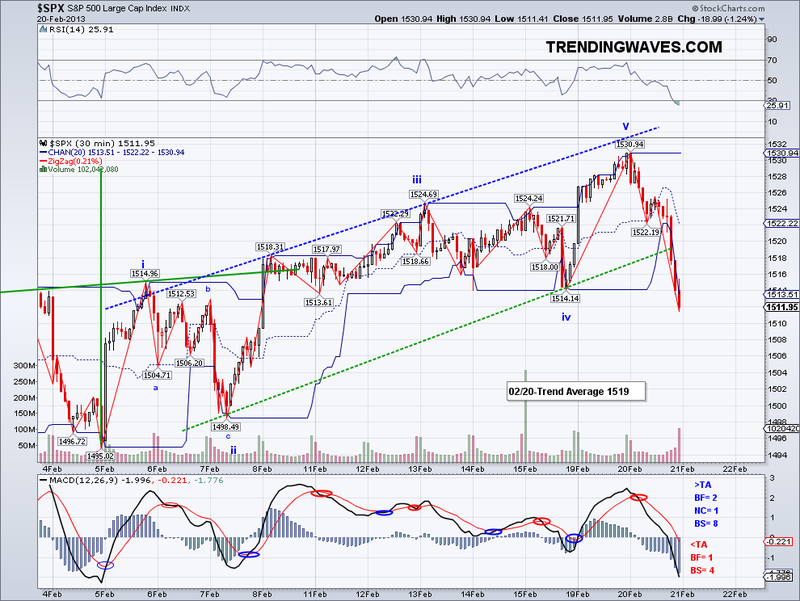 And today's action negates the potential bearish signal form yesterday. Looking at waves, it does look like a W4 was put in today on the micro count so the W5 might just start tomorrow and target the completion of the Inverse Head and Shoulders around 1535. I took back the VXX position yesterday but I will set it at break even should the market rise as chances are it will be in the $21s if the market makes it to 1535. It's been a frustrating hedge I must admit as one has to be very accurate with volatility ETFs but I am thinking at the end of this 5th waves there SHOULD be a substantial correction. I need my FXIs at < $38!! Lol.. The market made another post financial crisis high as I predicted yesterday but the market found the 1523 level challenging. 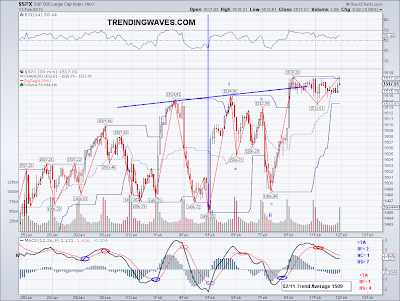 And like I said yesterday if 1523 gets broken then we might see a stronger rally to 1540+. But for now this key level is holding and volume is so light that it implies buyers are starting to exhaust, so perhaps the market is about to reverse. The Spinning Top candlestick put in supports the case as well as the Intraday MACD reversal. So I am watching how the Trend Average holds (currently at 1511) but for all intent and purposes, the "real" reversal will come when 1495 gets broken. 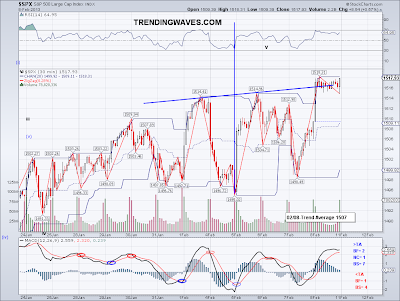 Until then the assumption is corrections and then higher highs as long as the market closes above the Trend Average. And to make something clear since I read a comment that didn't seem to understand what the TA is. The Trend Average is the daily median averaged out for an specific period of time. If today's number is higher than yesterday and yesterday was higher than the day before, then the Trend Average is bullish. This is not an subjective observation, this is a description of incrementally higher numerical values that establishes the direction of the market. So when I say the trend is bullish, it means the underlying numerical value is pointing UP as opposed to sideways or DOWN. This is what I refer to as "fact" and it would be a very costly mistake to turn a blind eye to this fact and start rationalizing why the market will do this or that.. I've seen many people come and go (as in losing money and leaving trading altogether) who do exactly just that despite the fact the trends are clearly posted everyday here. Then again, maybe there's the perception that free information is not as valuable.. big mistake. I bought back the VXX hedge at $22.38 so we'll see how that goes in the next few days.. The market consolidated its gains today and perhaps it might continue to do so tomorrow. But the market is technically be ready for another bullish leg to yet another new high for the post financial crisis rally. Seems like it was just last week where 1475 was the main target since the market had some convinced that was some sort of "long term top". So for now we'll see how the market behaves at the 1523 level, if the market is able to cut through that resistance level then it might head to 1540-1550 in a short period of time. Isn't top picking fun? lol.. I will be adding back the hedge soon hopefully or I might just wait for the TA to give me confirmation. FXI is trading under $40 so that's good, at $38 I will be a very happy.. lastly, someone asked about Gold. I think it is till working on a long term correction (possible triple bottom) so it should resume a long term bullish leg sooner rather than later. And for the record, I am not on margin for my GLD trade because I sold 20% of my long term position, so trading my own capital technically speaking. The market broke key resistance today and it looks like it will continue to go up despite all the reasons why it should take a break here. 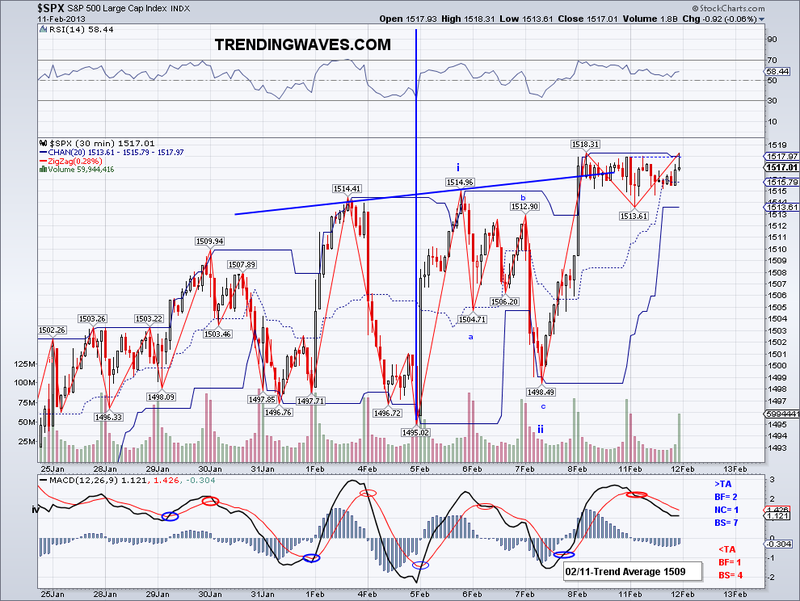 Also, there is a possible inverted head and shoulders that targets 1535 the wave today might just be a bullish W3. I did not label it yet as I want to see what Monday looks like but I covered the SPXU portion and buying it back next time I see a bearish sign. I predicted in December the market would likely hit 1600 if there is no recession and by the way it's going, we'll see 1600 by Spring. What's frustrating is the lack of corrections and again this is just clear proof the market goes up when it wants to go up regardless of what fundamental or technical reason why it shouldn't. The one thing that has gotten the market right is the Trend Average as it has only been breached for 1 day but has not changed trend since Jan 1st. Topping or another sideways correction? Going for an all time high?